ROFL! I cant believe I found Chacha Chaudhary on GR. But I've given a lot of nightnmares to my mother everytime I picked up a chacha chaudhary or Pinky from the railway station. That too in Hindi. Just for the laughs of the anguished expressions on my mothers face this comic deserves to be on my Read list! Felt every moment of my colorful childhood. Those torn pages, caricatures used to mope around my head. We lived in a suburb, hardly any "outbook" was available in local book store,except the text one. Whenever we traveled by train would get some, from the rail station bookstore or the hawker, they used to have some copies. Chacha Chowdhury's brain is sharper than any other computer of any configuration! Raaka was my favorite villain where Indian comic books were concerned. 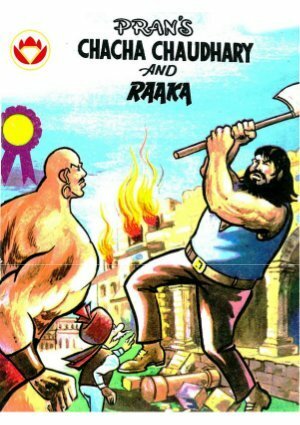 But considering the fact that these books were written for kids, there was a lot of killing (books where Raaka was featured). I still remember that he even slayed a very young girl with a sword. Talk about kids' literature, kids! This list reminded me of my childhood days. Awesome comics and awesome characters.